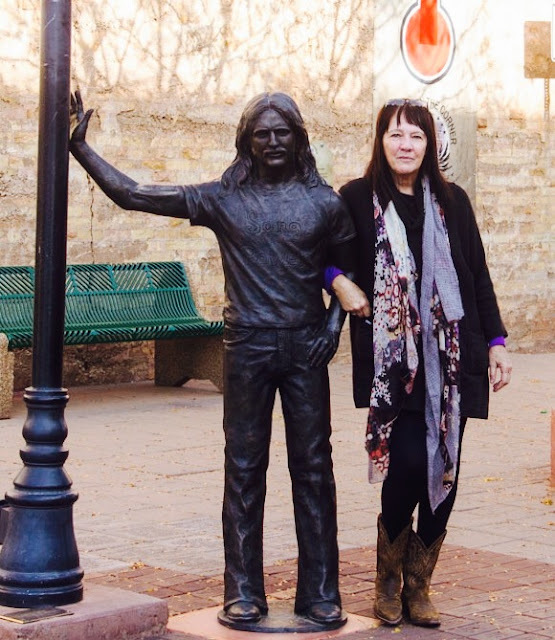 From the very beginning of the plan, all who know me have known, my dream was to go to Winslow, Arizona. Strange dream Sheila! I know guys, but you know how music wraps around the story of your life. So, we were off. We left yesterday morning from Edgewood, New Mexico and headed out on the highway on our way to Holbrook, Arizona. Mornings have been brisk to say the least but somehow refreshing. Well, except for the one morning my hands were REALLY cold. Our view from the dinning room window and Lola's favorite spot. At each stop Lola and I try and find at least one good area that I know she will be happy with doing her business and in Edgewood, that was easy. There was a nice somewhat "grassy" area that we would go, away from the brush and in clear site of possible snakes. The one bunny every morning was missed ,thankfully, by Lola. This was the Route 66 RV Park right off of I 40. Nice large pull throughs and lots of space between rigs. $35.00 a night and the coach was level. Since we had an extra day I did a painting. Oil on cradled board. Haha, I should call it Lola's Spot, but I won't. Heading towards Arizona the landscape started to change. Each corner was more awe inspiring than the other. I know, these photos just don't do justice to the colors. I've been shooting different scenes as reference for upcoming paintings. This was on our way taken from my side window. It was a 264 mile day to our stop for two nights. Ok RV Park in Holbrook, Az. They straddle rigs here but we have been lucky. Only a very small rig was beside us last night and today the night travelors have yet to arrive. Ok, this park is dusty dirt and stone. No grass. LOLA! Lola exits CiCiBlue excited to see what was there the day before, then goes into shock. He head swivels like an oscillating fan and she's not sure which direction to go. The dog walk is way out back by the fields of brush, "snakes", but we head to that area anyway. There is a long strip of loose sandy dirt and we walk along that. Lola steps on a straw blade of "grass" and looks at me sadly then walks on again. Yes, this all explains why we awoke to pee in the coach this morning, but on a mat. Today went better but since we go again tomorrow....Lord, she will need therapy by the time we get to our winter campground. After our quick walk last night I rushed back to get my phone to get these pics. Not enhanced, this was the sunset!! OMG! To the left was this. A fire in the distance. The colors were purples and pinks and the bright yellow. This morning we all got up at 5:00 A.M. to drive up to the Painted Desert. The sunrise was about 6:30 but the park didn't open until 7:00 o'clock. I got a pic of the sun just peeking up over the distant mountain. Spectacular! I am so not an early morning person but I'm so glad I got to see this. When we finally arrived at the Painted Desert the sun had already risen to the point where you miss the colors in the rocks. The park closes before sunset, so it will be missed then too. We weren't disappointed though. The view was breath taking! And again, I look at the scenery as to how it would make a fantastic piece of art. Hard to duplicate though isn't it. And here we are!! Still early in the morning and only a few people were there taking photos. Had to take this. How often do you get to see history. After our photo shoot we went across the street from "Standin' on the Corner" to have coffee and a breakfast sandwhich. If you ever get there, do go in. Huge and delicious! Yes, it's me and the other guy that's there. Silly maybe, but when you have a dream in you why not manifest it.? 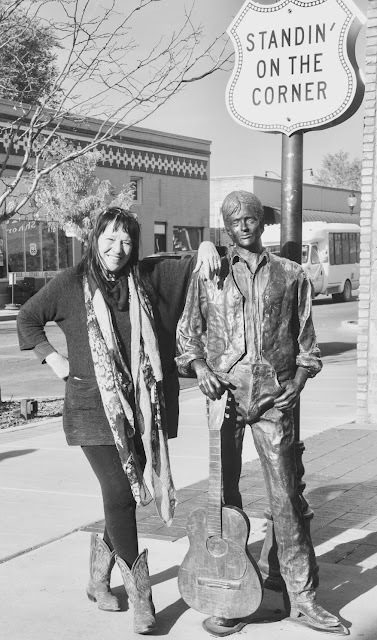 Standin' on a corner in Winslow, Arizona is just one more dream I have manifested and I know there are more to come!! Have a great night, tomorrow we head to Williams, Arizona and...dun, dun duuuun... The Grand Canyon!! Oh, and shopping. Betty said there are cute shops in Williams!! Where Are We And What Day Is It?